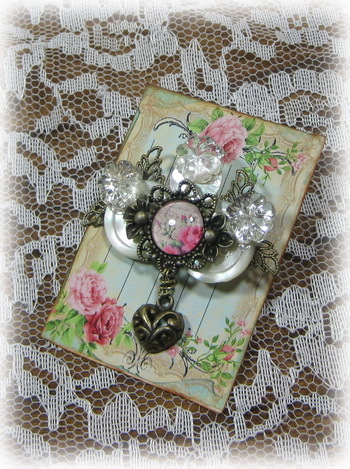 Artful Interludes: Vintage Broche' Bouton - New on my Etsy! Vintage Broche' Bouton - New on my Etsy! Button Art is so much fun I find so much inspiration in this unique art and keep coming up with many uses for it.such as,Pin to a neck scarf wear as a brooch, pin to a pillow or fabric bag, use as curtain tie backs, embellish boxes and wall hangings make one of a kind pendant use for altered bottle art ...the list goes on and I have many Vintage buttons, it can keep me busy for hours! I rec'd this lovely Vintage bag from Debi Huntsman in a swap..I just love it! I pinned my button brooch to the front of it. Melanie, your button brooches are so beautiful! I'm having so much fun learning how to make these. I love the beautiful brooch attached to your pouch, what a pretty addition. I love your button brooches Melanie..you do such beautiful work!! Oh you have been busy making absolutely gorgeous things!!!! I am impressed!